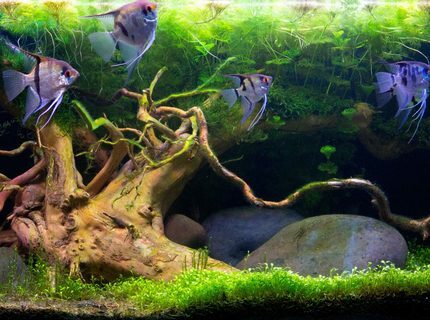 Fish Kept: Pterophyllum Scalare Surinam, Diamond Tetra, Ghost Glass Cat, Bolivian Ram, Black neon tetra, Pencil Fish, Ottos. Corals/Plants: Echinodorus Kleiner Bar Staurogyne Repens Cryptocoryne Legroi Bolbitis heudelotii Limnophila hippuridoides Nymphaea lotus red Didiplis Diandra Echinodorus Bleheri Microsorum pteropus "narrow" Cyperus Helferi Ammannia Cracilis Java "Trident" ...and more. Advice: Do research first and determine possibilities before proceeding. 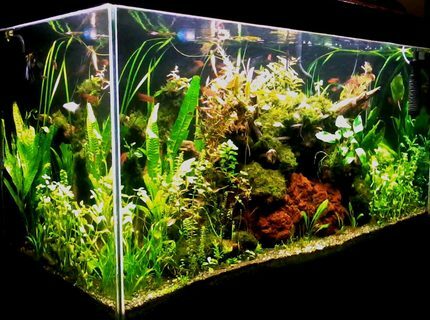 Corals/Plants: Just about everything with preference for Cryptocoryne in freshwater and Euphyllia in Marine. Quote: DO, or DO NOT, There is no try. 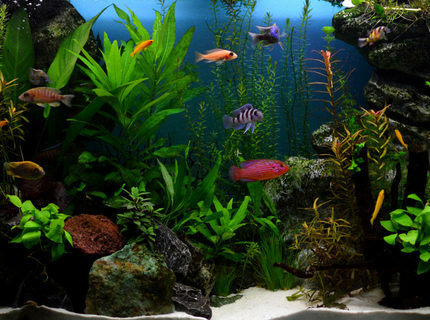 About Yourself: Aquarist for more than 20 years. 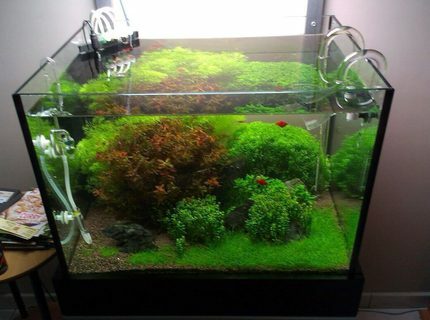 Tried reef with this tank but had to work outside the country. (very sad when I euthanized it). This is also an in-house management training for the whole family. Team work plays a vital role in this tank maintenance specially if I only come home on weekends. (Anyway, family members requested to revive this.) Most of us enjoy watching the "foodball" during feeding and non- feeding time. Well, so far, so good, this has been with us for more than 6 months now. Corals/Plants: elephant ear, crypt. 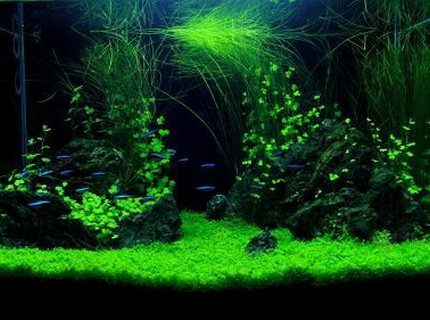 wenditii, eleocharis, microsword, java moss, anubias nana, water sprite, red lotus, hair grass, and a lot. Advice: Don't be afraid to try something after doing a thorough research on what you wish to apply. 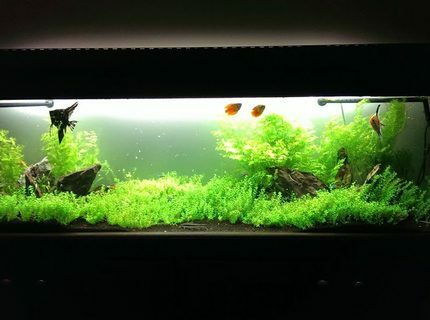 Description: 48 x 24 x 18 inches (low tech/ natural method) Latest image taken with java ferns. DIY lighting system with 1 x 28 watt blue lamp (subdued light) and 4 x 28 watt T5 tube all on timer. DIY overhead filter with enclosed pre-filter inside a very large plant box. DIY CO2 (yeast) directly injected at the moment with powerhead. 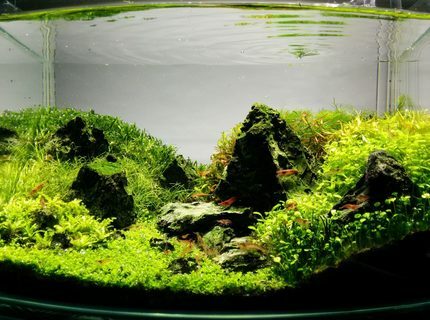 Top Substrate is sieved construction gravel (2-3 mm) while underneath is a combination of dirt and potting soil. 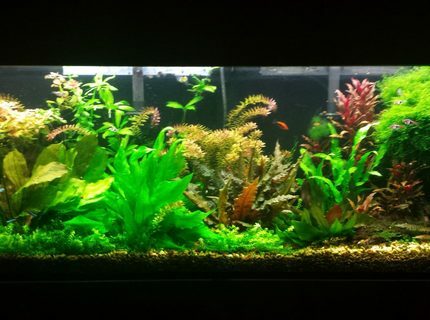 8 gallon up to 50% weekly water change depending on my mood. DIY excel daily while DIY fertilizer formula and DIY trace element on schedule basis. The application regimen is carried-out by daughter and wife (only home at weekends). Air pump on at 6pm and off at 6am. 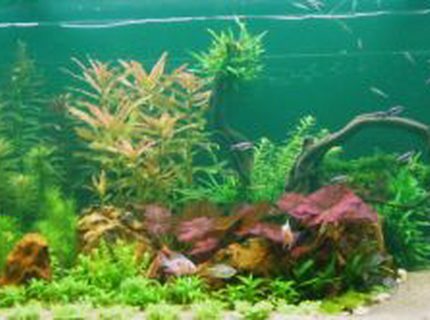 About Yourself: I have had fishtanks sice young age, sometimes stopped some years but always returned. Since a few years paused on plants and how to keep them. 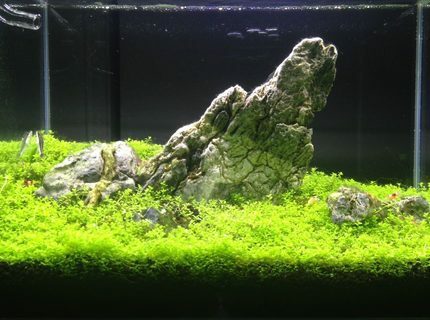 Advice: If you struggle with algae, don't give up and read as much as can, you will succeed!